Kelsey Kruse (‘20) concentrates as she sprints to the ball. Last week, Women’s Tennis continued their successful season with wins at home and away. On Tuesday, Sept. 26, Luther won 9-0 at home against Loras College, followed by an 8-1 victory at Wartburg College on Saturday, Sept. 30. These wins add to this season’s record of 6-1. The teams only loss was a home meet against Wheaton College on Sept. 2. The meet against Wheaton College was not part of the Iowa Conference schedule, putting the conference record at 6-0. Anna Pearson (‘18) reflected on the season and assessed the team’s current position. 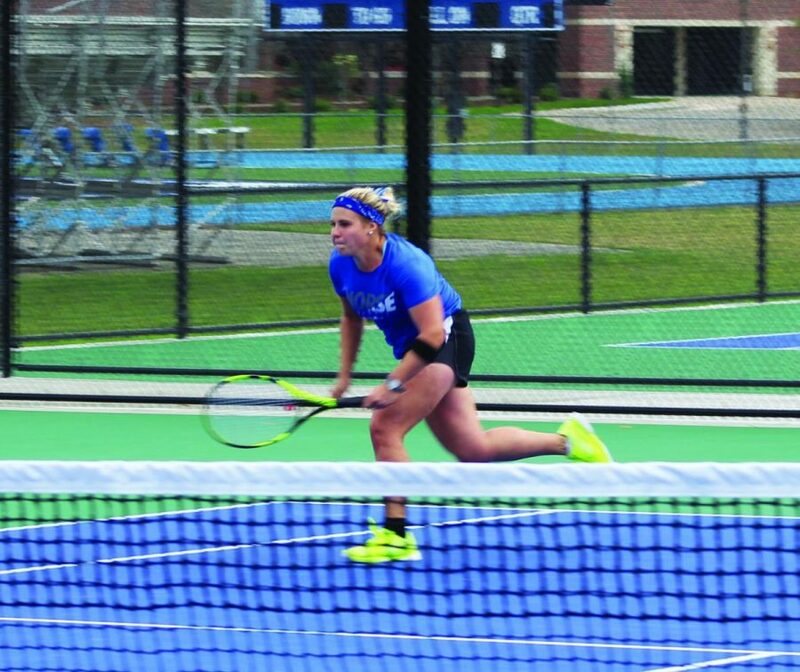 Luther won all their doubles and singles matches during Tuesday’s meet and all but one singles match at Wartburg. According to Head Tennis Coach Adam Strand (‘04), the team performed well when taking the athletes’ stress levels into account. Strand also acknowledged the stress of competing during school hours. One factor that improved this week’s outcomes was the notable drop in temperature. This change was felt by players and spectators alike. “We were expecting hot and humid so it was nice to have a break from that,” Pearson said. According to the National Weather Service, temperatures earlier this month were in the nineties with little precipitation. These temperatures can be dangerous for athletes due to dehydration and heat-related illness. According to attendee Ryan Ortega (‘21), spectators also appreciated the cooler temperatures. Spectators at Tuesday’s meet came not only to cheer on the players, but coaches. Joan Strand (‘74), and John Strand (‘72) came to support their son Coach Adam Strand and his team. Adam Strand appreciated his parents support at the meet. As the end of the fall season approaches, the team hopes to continue their winning trend and hone their skills. The women’s team will continue their season with meets at Simpson College in Indianola and Central College in Pella, Iowa on Saturday, Oct. 7.